A one-way street on Chicago’s Northwest Side is becoming an increasing source of frustration for residents who claim it is a public safety hazard and a property owner who argues the city is not being responsive to the situation. NBC 5's Chris Coffey reports. A one-way street on Chicago’s Northwest Side is becoming an increasing source of frustration for residents who claim it is a public safety hazard and a property owner who argues the city is not being responsive to the situation. The stretch of Clarence Avenue is not wide enough for many larger vehicles to turn around, due in part to a chain link fence placed near the property line of an adjacent empty lot. Stephanie Golden said she’s hit the fence several times while backing out of her driveway. “It’s pretty frustrating. We have four kids that go to school and are in different sports and we’re leaving a number of times a day,” Golden said. Jack Jennings said when his wife needed an ambulance in 2014, he watched the paramedics negotiate backwards in the ambulance to avoid the fence. According to residents, the empty lot was a popular location for block parties and kids’ playing activities for decades and there was enough room to drive in both directions. Bridget Healy purchased a nearby house in 2011 and the lot came with it. 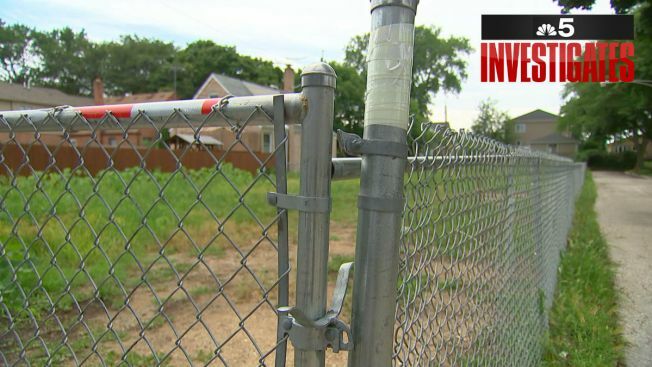 She told NBC 5 Investigates the fence was built around the lot in 2014 for liability reasons. But Healy said she understands the neighbors’ frustrations and is trying to work with the city to resolve it. In fact, the city explored purchasing a section of the empty lot to widen the street. But according to Healy, those talks have stalled. A law department spokesperson said the city could not reach an agreement with the property owner. Additionally, the spokesperson said the street is wide enough for emergency vehicles. Yet something must be done to help the residents, according to 41st Ward Alderman Anthony Napolitano. “I’ve got about three or four childhood friends that live on that block as well, who have come to me day one saying, ‘Hey Anthony you got to fix this, this is an absolute debacle over here,’” said Napolitano. Napolitano inherited the neighborhood fence dispute from the two prior aldermen.